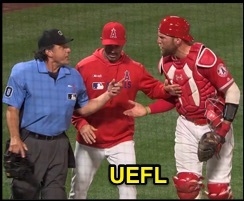 HP Umpire Phil Cuzzi ejected Angels catcher Kevan Smith (strike three call; QOCY) in the bottom of the 7th inning of the Brewers-Angels game. With two out and none on, Smith took a 3-2 fastball from Brewers pitcher Junior Guerra for a called third strike. Replays indicate the pitch was located over the heart of home plate and at the hollow of the knee (px 0.25, pz 1.45 [sz_bot 1.63 / RAD 1.507 / MOE 1.424]) and that all other pitches during the at-bat were properly officiated, the call was correct. At the time of the ejection, the Angels were leading, 4-2. The Angels ultimately won the contest, 4-2. This is Phil Cuzzi (10)'s first ejection of 2019. Phil Cuzzi now has 4 points in the UEFL Standings (0 Prev + 2 MLB + 2 Correct Call = 4). Crew Chief Phil Cuzzi now has 1 point in Crew Division (0 Previous + 1 Correct Call = 1). This is the 14th ejection report of the 2019 MLB regular season. This is the 10th player ejection of 2019. Prior to ejection, Smith was 0-2 (2 SO) in the contest. This is Los Angeles' 1st ejection of 2019, 2nd in the AL West (HOU 2; LAA 1; OAK, SEA, TEX 0). This is Kevan Smith's first career MLB ejection. This is Phil Cuzzi's first ejection since September 16, 2018 (Chip Hale; QOC = Y [Balls/Strikes]).